Pink Parcel is the UK's No.1 period box, it's a subscription box for, well you've got it, that time of the month with over £40 worth of femcare & beauty products each month. It's designed to allow us to pamper ourselves while also taking care of our menstrual needs. You can select from either tampons or towels or a mixture of both. For medical reasons I cannot wear tampons, so I chose to have towels in my December box: Always extra long with wings. 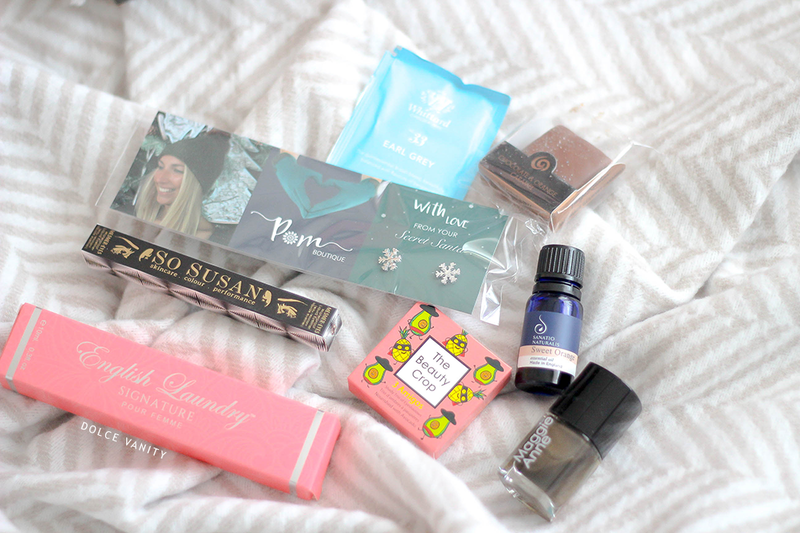 Included in the box was Whittard Early Grey, Fudge Kitchen Orange Caramel Fudge, English Laundry Signature Purse Spray, Maggie Anne Nail Polish, Pom Secret Santa Snowflake Earrings, Sanatio Naturalis Sweet Orange Aromatherapy Oil, The Beauty Crop Eyeshadow Trio & So Susan Mesmer-eyes Waterproof Liquid Eyeliner. My period during December came right on Boxing day, lovely. Right on time and when I'm back to work, my cramps and backache were a nightmare. The pink parcel came with a little drawstring pouch for me to put my towels in which is so helpful and cute to have in my bag and allow it to be discreet while at work needing to change, although for me it's not a problem to be honest as we are all women but it's nice to have that choice. Being able to just pamper even if it's to paint my nails, relax and have a cuppa or even just indulge in some chocolate if that's your thing. For £12.99 it's worth a try at least once! Hmmmm. Like you, I am a towel girl. Also as a beauty editor I have seen loads of beauty and lifestyle being launched and I must admit that this one seems very gimmicky. Why do you need a nail polish? How is that relevant to being on your period? It seems like they want to be a niche brand but also mainstream too. I would rather just take the £12.00 and buy a couple of packets of sanitary towels.